Storage almost Full message appearing constantly on my red iPhone 7? iPhone 7 can’t take photo because there is not enough available storage to take a photo? 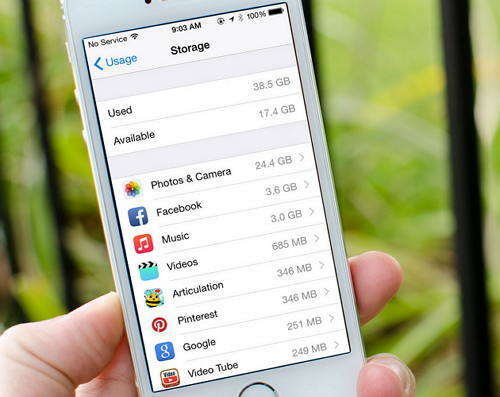 iPhone is the greatest smartphone on the market but short for its limited storage space? With time, your iPhone 7 will accumulate a series of files including photos, videos, apps and needless files like junk files, caches, logs, history. Thankfully there are plenty of quick and easy ways you can free up space on your iPhone 7 and iPhone 7 Plus. Below we list the 3 biggest ways for you to manage space. Before we get started it’s important to find out what’s taking up the most space. Hop over to Settings > General > Storage & iCloud Usage and under the Storage subhead, select Manage Storage. The next page will display how much storage is being used, how much storage is available and which apps are taking up the most space. The app like Angry Birds, Candy Crush itself doesn’t take up too much space but the “Document and Data” in it will eat up large space. So go ahead and delete them if you don’t need them any more. Be aware of the app internal downloads. In some apps such as Spotify, YouTube , if you have too much music or videos downloaded, it will takes up a ridiculous amount of storage space. Photo Stream will automatically sync last 1,000 photos across your iOS devices, which means you will stores those 1,000 photos twice. What a large space they take up! So if you don’t need to share your photos from your iPad to your iPhone all the time, turn it off. Go to Settings, scroll down to Photos & Camera and toggle off My Photo Stream. Have you found that you have two images of the same photo saved in your Cameral Roll? This is due to that you use the HDR on your iPhone while also keep the Normal Photo. Go to Settings > Photo & Camera. Scroll to the bottom and deselect Keep Normal Photo. Check up your iPhone storage in iTunes you’ll find that most space on your device is taken up by “Document and Data”. What’s worse? You have no idea about what it is. Generally, they are extra data (such as logs info, cookies, caches or downloaded images and videos) created by the apps on your iPhone. Go to Settings > General > Storage & iCloud Usage and select Manage Storage. Here you can see which app takes up most storage. The most efficient way to delete "Document and Data" is uninstalling and reinstalling the app. It is not easy to take every steps to make space on an iPhone. Now with Tenorshare iCareFone, you can get rid of all those tedious tasks and cleanup your iPhone 7 and iPhone 7 Plus in a single way. It can deeply analyze your iPhone and manage storage in five efficient ways: Cleanup all junk files (cache, history and attachments), clear temporary files, compress photos without quality loss, delete hidden large files and uninstall apps. Get more details on how to manage storage on iPhone 7/7 Plus with Tenorshare iCareFone. So we have share the top 6 tips on how to free up space on iPhone 7 and iPhone 7 Plus. You may also interested in Tips to Take Care of Your iPhone 7 /7 Plus and Keep It in Good Condition.